The White – Kentucky population data represent DNA samples from 349 Caucasian (White American) residents of Kentucky. Samples were provided by the Kentucky State Police and the Federal Bureau of Investigation. Actress Ashley Judd grew up in Kentucky and is the sister of country music artist Wynonna Judd. 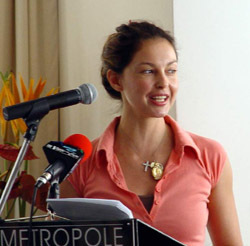 Photo: Ashley Judd in South Africa in 2005 helping raise awareness for AIDS. Public domain. Source publications: Identifiler User Guide.